This Dear America novel of a farm family in Dalhart, Texas in 1935, written by fifteen year old Katlan Janke is presented in the form of a child’s diary. 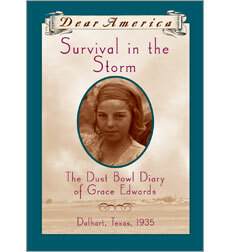 Grace Edwards receives her diary on Saturday, February 16, 1935 as a gift from her friend Helen for her twelfth birthday. She makes her first entry the following day sitting alone in the hayloft. We learn that her father is a farmer, that they have their own spread just outside of Dalhart, Texas, and that besides her mother, she also has a little sister, Ruth, who is seven years old. Her parents gave her the book Anne of Green Gables for her birthday and Ruth gave her a hand-made bookmark. The wind howls relentlessly because this family lives at the southern edge of No Man’s Land, what later was called The Dust Bowl. Compared to other families, the Edwards are actually doing reasonably well. They aren’t wealthy, like the McCalls, whose daughter Sadie is always lording it over the other kids in the one room schoolhouse, nor dirt poor like the Walkers, whose daughter is Helen, but they scratch along without government aid. Somehow, they usually manage get enough out of their garden to can vegetables for the winter and her father usually gets just enough wheat out of the dust-blown fields to make do. They own two cows, so the kids actually get fresh milk most of the time. But they don’t have money for the picture show and the girls and their Mama have to sew new dresses from seed bags. When Daddy goes to buy seed, typically the family goes along so they can make sure they get matching bags for the new clothing. They attend Sunday school and church on most Sundays when the wind isn’t blowing too hard and they put on competitive plays when school shuts down before summer. This is an especially bad year as there are many dust storms that blow through, gigantic black clouds that roll over the land dropping fine, dry topsoil that has been picked up from the drought-stricken prairie farms. Many times these storms go on for hours, turning the land midnight black and accumulating in the lungs of people and their animals. Dust pneumonia is a common illness. Cattle die from inhalation. Grace’s world is torn apart when the Walkers reach the end of the line and head out for California. Losing her best friend is a big blow to Grace and she struggles to comprehend and deal with the loss, but there are bigger problems ahead. Black Sunday occurs on April 14, 1935. A dust storm rising 10,000 feet high and two hundred miles wide descends across No Man’s Land. As the family prepares the house by wetting and hanging up sheets across windows and doors to catch the dust, Ruth is sent out to get the rest of the whites off the line. Grace looks for her and sees that she is missing, so she sets out looking for her. Ruth has chased a blowing dish towel. Separated from their family as the storm approaches, the two girls take shelter in the abandoned Walker house. Holding cloth over their faces, they hunker down and try to keep breathing as the storm howls around them. The book is very well written, especially for a fifteen year old writer. Janke grew up in Dalhart and had local oral sources for original stories, as well as the Dalhart museum for research, including all of the local newspapers of the time. Her re-creation of 1935 is completely believable, not just in the small details of household life, but in her understanding of the weather, the small local society, clothing, farm animals and so forth. Neither Grace, nor any of her family or friends rings false. There are indeed, many moments of the book that are quite moving and Janke must be accorded a great deal of success in her efforts. I loved the book from beginning to end. If I might find any area of complaint, it’s that the great physical pain that these people suffered does not seem quite visceral enough. It is a small complain indeed in a largely successful novel for young adults. I highly recommend this book, not just for young adults, but for families and general readership. It well-written, moving, and a terrific depiction of The Dust Bowl.